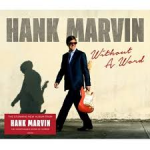 Share the post "Album review: HANK MARVIN – Without A Word"
Hank Marvin is a guitar legend of that is there no doubt, having influenced many other guitar greats like Brian May, Jeff Beck, Mark Knopfler and even those not associated with guitars like Jean-Michel Jarre, who cites Hank Marvin as an influence to him deciding on a career making instrumental music. This is Hank Marvin’s sixteenth solo album and is a collection of his favourite songs, plus one new song ’Russian Doll’, which was co-written with his son Ben. Hank Marvin’s playing is so distinctive and he weaves his guitar magic on classics such as the Beatles’ ‘The Fool On The Hill’, and he really has fun on ‘America’, trading off guitar licks with the keys of Harry Mitchell and trumpet of Mark Underwood. There is a very jazzy feel to many of the arrangements on here, none more so than on ‘Alfie’, which like the rest of the album features drummer Ben Vanderwal, who is a much in demand jazz player in Australia. His gentle touch, along with bassist Roy Martinez really bring an extra dimension to the sound. I played the ‘Dr. Who’ theme to my young son to see if he recognised the tune and he got it as soon as the first guitar notes rang out! Just shows how effective Hank Marvin is at adapting a classic theme tune to his style of playing. This entry was posted in ALBUM REVIEWS, ALBUM REVIEWS (Mobile), All Posts and tagged album, Cliff Richard, Dr Who, film sountracks, guitar, guitarist, Hank Marvin, instrumental, review, The Shadows, Without A Word. Bookmark the permalink.